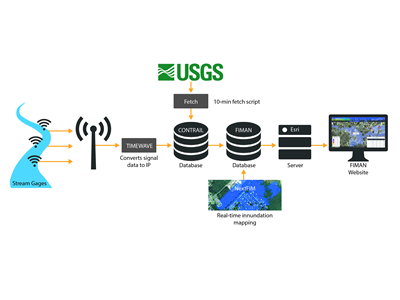 To provide rain and stage gage data, flood inundation maps, flooding impacts and alerts in real-time to support risk-based decisions regarding flooding. 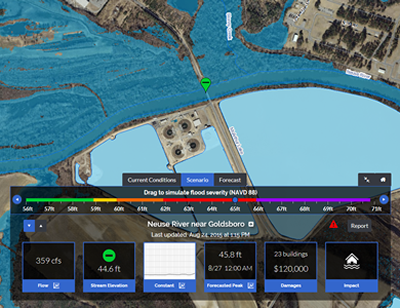 This web site provides real-time data on stream elevation, rainfall and weather parameters from over 550 gages across North Carolina. Some sites may be rain or stage gages only while some may have weather data available. Many of these gages are managed by the Division of Emergency Management (NCDEM) while some are operated by local government agencies and private organizations. Additionally, gages from the U.S. Geological Survey are included in this network. Data from the NCEM gages in Western North Carolina are transmitted by radios and a network of mountain top repeaters to various receiving sites in Western North Carolina. The data is then transmitted by the internet to a central database for display on this web site. Data from NCEM gages in Eastern North Carolina are transmitted by GOES satellite. Data is provided to the National Weather Service to aid in their rain and flood forecasts. This web site also contains inundation maps at selected sites across the state as well as along entire river basins. Flooding risk information is provided for areas with inundation maps. For each incremental rise in flood waters buildings, roads, and infrastructure that would be impacted are identified. 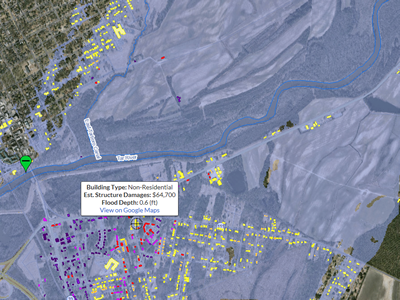 Information on water depth in each building affected along with estimated damage costs are displayed.